This past Friday night at Jefferson Memorial Stadium, Colby Wood scored five touchdowns for the Dragons, in their 32 - 17 win over Winder-Barrow. I've already had eight e mails asking me if that was a Jefferson High School scoring record for one game. When you think of really great legendary running backs at Jefferson, you think of Jeff Davis, Curtis Segars, Don Cole, Gary Duke, Billy Ricks, Johnny Spence, Bobby Gooch, Todd Berry, Jack Kesler, Matt Childress, Tristian Jackson and Sammie Williams among others. All of these backs scored four touchdowns in a game at least once during their Dragon playing days. But five is a different matter. That has been the ultimate scoring mark for the Dragons since 1950. In the 1950 season, Jefferson played Stephens County on October 27 in Jefferson. The Dragons won the game 65 - 6 during their 9 - 0 - 1 undefeated regular season. In this game, Curtis Segars scored five touchdowns. He ran for 206 yards on 17 carries. His touchdowns were runs of 24, 17, 65, 31, and 29 yards. He also ran for five extra points in that game to finish the night with 35 points. This is still a Jefferson Dragon record for individual points in a game. It is interesting to note that in the Royson game that same season Don Cole scored three touchdowns on runs of 90, 38 and 25 yards against the Purple Hurricanes. He had two touchdowns called back ( 82 and 28 yards ) for penalties in the 47 - 0 Dragons win. In the 1956 season Billy Ricks ran for three touchdowns and caught a 30-yard touchdown pass from Bennie Tompkins in a 39 - 0 win over Clarkston in Jefferson. Ricks had two touchdowns called back of 64 and 39 yards. He is the only Jefferson back that potentially ( two did not count ) rang up six touchdowns in a game. The 1958 season saw a freshman Jeff Davis enter the Jefferson football program. This team finished with an 8 - 2 record and a number 5 state ranking in Class B. Their losses were to Commerce, a Class A school and eventual Class B state champion Morgan County. The best football player on that team was not Jeff Davis but Gary "Fireball" Duke. 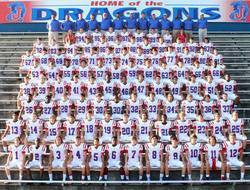 On October 24 in Jefferson the Dragons defeated Thompson 46 - 19. In this game Gary Duke, a 170 pound senior, scored five touchdowns. Duke scored on runs of 3, 36 and 26 yards. He also had a 60- yard pass interception return and a 60-yard punt return for touchdowns. You would have expected the best running back in Jefferson history, ( up to this point ) Jeff Davis to put up five touchdowns somewhere along the way. The twice all-state performer completed his milestone on the night of October 14, 1960 in Jefferson. The opponent was Georgia Industrial Institute. Davis scored on rushes of 62, 3, 70 and 35 yards. He also returned a punt for a 75-yard score. For the night he carried the ball nine times for 221 yards and joined the very exclusive five touchdown club for the Jefferson Dragons. The 70-yard touchdown has been called by many the most unbelievable run in Dragon football history. Davis took a pitch-out from his own 30-yard line, ran to the left, saw his path blocked, reversed his field to the right, juked out two defenders and again reversed his field to the left. He ran over a defender at his 45-yard line, spun away from two more defenders at the 50-yard line and broke loose for the score. He had that unbelievable combination of speed, power and athleticism that rarely came along at that particular time. My most memorable Davis run was a 99-yard run up the middle of the field on a quarterback sneak versus Madison County on Halloween night in 1959. During the 1994 season, Matt Childress scored five touchdowns against Lumpkin County in the Dragon season opener in Jefferson. He returned the opening kickoff for a score, returned a punt for another score, had two rushing touchdowns and completed his record-setting night with a pass reception touchdown. Jefferson won the game 42 - 7. As far as I know these are the only members of the five touchdown club for the Jefferson Dragons. I'm doing this from memory, so I might have missed someone along the way. If I did, I'll apologize before the firestorm. Now Colby Wood has joined the list of Jefferson football players that scored five touchdowns in a game. He did it against a very good team when the game was on the line. After only two games this season, I think it is easy to see where Colby has a real nose for the goal line. He also has the trust of the coaching staff to hang onto the ball down close to the goal line when all the gouging and punching of the ball is going on. Don't be too suprised if he gets that sixth touchdown in a game somewhere along the line. If not this season, certainly over his next two seasons. Oh, yes. The Dragons did beat a very good Winder-Barrow team 32 - 17. Our team came back twice from behind to dominate the second half. It was somewhat scary for awhile, but once the rushing offense came into sync it propelled the team to a convincing win. Now North Hall will come into Jefferson wanting to rebuild their winning culture from several years back. It should be an entertaining game. One closing note: I am very impressed with Bryce Moore at quarterback. He brings to mind another young quarterback that became a legendary Dragon _ Evan Sherriffs. I think if Evan had played much as a sophomore, he would have looked alot like Bryce Moore at this time. Young Moore certainly enhances the opportunity for the Dragons to be formidable in the quarterback slot for the next three years. ( This year obviously included ). JEFFERSON — Note to the rest of northeast Georgia: Colby Wood and the Jefferson rushing attack are most definitely for real. Last week, the sophomore running back went for 264 yards; this week it was 239 -- and five touchdowns -- as he helped lead Jefferson to a 32-17 win over Winder-Barrow in Jefferson. Not only that, Wood also recorded a fumble recovery, interception and a tackle for loss on defense. Meanwhile, the Dragons' defense did its best to slow Bulldoggs standout running back Cece Green -- especially in the second half. Green broke lose in the first half, ripping off a 55-yard touchdown run as part of 195 yards for the visitors. Yet Winder managed just one first down in the second half, as Jefferson (2-0) pulled away for the win. Wood, in particular, went wild after the interval, piling up 187 of his yards in the second half. He finished the night with 33 carries. Four of his scores came on the ground, while he also hauled in a 21-yard scoring pass from quarterback Bryce Moore. Teammate Darrian Hill also finished with 11 carries for 70 yards, while Moore completed 5 of 10 passes for 62 yards. The Dragons will play host to North Hall next Friday. Winder, which finished with 151 yards rushing, will travel to Apalachee next week for the start of Region 8-AAAAA play. JEFFERSON | Jefferson’s Colby Wood turned in his second impressive performance of the young season Friday night as the Dragons – ranked No. 4 in Class AAA – defeated visiting Winder-Barrow 32-17. Wood rushed for 239 yards – 187 in the second half – and four touchdowns; he also caught a 21-yard touchdown pass and while he wasn’t busy running into the Bulldoggs’ end zone, he also posted an interception, a fumble recovery and a tackle for loss. 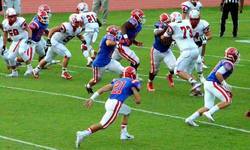 The Dragons rolled up nearly 400 yards of offense, with 333 yards coming on the ground and 62 yards in the air. Bryce Moore completed 5-of-10 passes for 62 yards and a touchdown. CeCe Green scored on a 55-yard run in the third quarter for Winder-Barrow and Noah Chapman tossed a 21-yard touchdown pass to Green in the first half for the Bulldoggs’ first score. Wood rushed for 260 yards and three touchdowns in the Dragons’ season-opening 19-7 win over Rabun County last week. 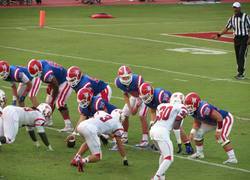 Jefferson (2-0) will host North Hall at 7:30 p.m. Friday. Winder-Barrow (0-1) will play at 7:30 p.m. Friday at Apalachee. Others receiving votes: Central-Carrollton 12, West Hall 10, Cook 7, Jackson 5.